Lights Out is a 2016 American supernatural horror film directed by David F. Sandberg in his directorial debut, produced by Lawrence Grey, James Wan, and Eric Heisserer and written by Heisserer. It stars Teresa Palmer, Gabriel Bateman, Billy Burke, and Maria Bello. It is based on Sandberg's 2013 short film of the same name and features Lotta Losten, who starred in the short. The film had its world premiere at the Los Angeles Film Festival on June 8, 2016, and was released in the United States and Canada on July 22, 2016, by Warner Bros. The film received positive reviews and was a box office success, grossing $148 million against a budget of $4.9 million. In a textile factory during closing hours, an employee named Esther encounters a silhouette of a woman when the lights are off, but cannot see it when the lights are on. After she leaves, her boss Paul encounters the woman and he is killed after she chases him through the factory. A short time later, Paul’s daughter Rebecca is called into the school nurse’s office because of her brother, Martin. Rebecca and Martin are half-siblings, sharing the same mother, Sophie. The nurse was unable to get in touch with Sophie to inform her that Martin has been falling asleep in class lately. Child Protective Service agent Emma Glover questions Rebecca about Martin’s living conditions. Rebecca tells the official that Sophie has depression, and is taking antidepressants. Rebecca also tells the official that Paul was her stepfather, and that her real father ran away when she was a child. Rebecca and her boyfriend, Bret, take Martin to Sophie’s house. Martin tells Rebecca that Sophie has been talking to a woman named “Diana”. Rebecca assures Martin that Diana is not a real person, and that she had also heard Sophie talk to the imaginary Diana when she was a child. Rebecca gets in an argument with Sophie when she realizes her mom is not taking her medication, so she takes Martin to her apartment so he can rest. That night, Rebecca is woken by the same woman that killed her father after she notices her scratching at the floor. Rebecca narrowly escapes an attack from the woman when she turns the lights on and the woman disappears. The next morning, Rebecca notices the word “Diana” has been scratched into her floor, along with a stick figure drawing of a woman. Rebecca has a flashback to when she found the same name and drawing as a child, and realizes Diana is real. While her mom is running errands, Rebecca sneaks into Sophie's house and finds a box of medical records and other research in Paul’s office. Paul's findings reveal that Sophie was admitted to a mental hospital as a child. While there, she befriended a young patient named Diana. Diana suffered from a severe skin condition, and was accidentally killed by the hospital staff when they performed surgery on her under intense light. Rebecca also learns that Diana was admitted to the mental hospital after her dad committed suicide, and that it was believed that Diana was able to "get into people's heads". Rebecca, Bret, and Martin stage an intervention at Sophie’s house about how Diana’s spirit is haunting them all. Sophie becomes irate, says she won’t abandon her friend, then locks herself in her bedroom. The group decides to stay the night at Sophie’s, intending to get her help in the morning. To avoid an attack from Diana during the night, they rig the house to be as brightly lit as possible. This proves to be useless when Diana cuts the power to the neighborhood. Diana traps Rebecca and Martin in the basement, and attempts to kill Bret. Bret escapes Diana, and drives off to get help from the police. In the basement, Rebecca finds a black light while searching for light sources to brighten the basement. When Rebecca clearly sees Diana with the black light, she realizes it’s not powerful enough to harm her. Bret returns with two police officers. The officers free Martin and Rebecca from the basement, only to be murdered by Diana. As they’re fleeing the house, Rebecca remembers Sophie is still in her bedroom. As she climbs the stairs to retrieve her mom, Diana tells Rebecca that she killed Rebecca’s father years ago. Diana throws Rebecca off the second floor landing. As Diana prepares to kill Rebecca, Sophie appears, with a gun from one of the dead officers. Sophie realizes she is the tether for Diana to exist in the real world, and sacrifices herself to save Rebecca. As Sophie’s body falls, Diana vanishes. Later, Bret comforts Martin and Rebecca in an ambulance outside of Sophie’s house. The three of them appear to be slightly spooked when the ambulance lights flicker, but Bret assures them that Diana is truly gone. Sandberg, along with his wife Lotta Losten, created the initial short film for a film competition. Although the film did not win the competition, the short soon went viral, leading to Sandberg to be contacted by several agents, to the point where he had to develop a spreadsheet to keep track of them all. One of the contacts was Lawrence Grey who wanted to collaborate with James Wan in order to produce a feature-length version. Although Wan enjoyed the short, he was hesitant that it could be turned into a feature until Sandberg produced a treatment for the feature-length version. The move to Hollywood was somewhat hectic for the couple, requiring that Losten quit her day job in order to do so. Once in Hollywood the two were unable to get an apartment due to a lack of credit, forcing them to rent Airbnb on a monthly basis. In June 2015, Gabriel Bateman and Teresa Palmer were cast in the film as the child and teenager leads. In that same month, Maria Bello was cast in the film as the mother of Bateman and Palmer's characters, alongside Alexander DiPersia as the boyfriend of Palmer's character, Billy Burke as the stepfather of Palmer's character and father of Bateman's character, and Alicia Vela-Bailey as the main antagonist Diana were also starring it. Sandberg had not worked with a film crew or visited a film set before directing Lights Out; he had to ask the first assistant director, "So when do I say action?" Principal photography for the film began in June 2015 in Los Angeles. Filming wrapped on August 5, 2015. Special effects of having the ghost appear and disappear were mostly done by using a split-screen technique as also used in the short. Sandberg said "Whenever she’s in frame with another character, it’s basically just a split screen. So you shoot it with her and without her. You turn the camera on with her, you turn it off and she walks off, and then you turn it on again. It’s super simple, actually." Sandberg also made a list of what he called the "light gags", or different ways to create light sources from flashlights to cell phones and gunfire. In the scene when Diana appears in Rebecca's room, James Wan suggested replacing passing car headlights in an early treatment with the flashing neon sign that appears in the final film. Sandberg originally based the character of Rebecca a real girl that he knew who was going through depression and being a cutter which is why Rebecca has scars on her arms, but the development of the film made it less of her depression, and more of a ghost story in which Diana would have been the real person who died and became a ghost. Wan came up with the idea of making Diana the ghost. Rebecca's boyfriend was also given a twist of being a rocker, but is actually committed and responsible, even driving a safe car like a Volvo. Another twist Sandberg liked was making the imaginary friend for the mother rather than the trope of having the friend be for the child. After hearing concerns from critics that the ending of the film was promoting suicide, Sandberg interviewed with The A.V. Club where he said he was distressed about that idea, and wanted to explain his position. He said that he originally wanted to make a film about depression, as he has also suffered from it, and that one of his friends had committed suicide. Diana was not a ghost back then, but during the development of the film, it became more of a horror film. It still retained some themes about depression and mental illness. He had originally shot a second ending to the film in which Martin becomes depressed and Diana comes back one more time before she is killed. However, test audiences hated that ending, saying that Sophie's sacrifice would have been in vain. The film had its world premiere at the Los Angeles Film Festival on June 8, 2016. The film also screened at Comic-Con on July 20, 2016, and was released on July 22, 2016. Lights Out grossed $67.3 million in the United States and Canada and $81.6 million in other territories for a worldwide total of $148.9 million, against a production budget of $4.9 million. In North America, Lights Out was projected to gross $13–15 million from 2,900 theaters in its opening weekend. It made $1.8 million from its Thursday night screenings and $9.2 million on its first day. The film exceeded expectations and earned $21.7 million in its opening weekend, finishing at third place behind fellow newcomer Star Trek Beyond and holdover The Secret Life of Pets. In other territories, the film earned $8.5 million in its opening weekend from 3,737 screens in key markets of Russia and Australia along with 30 smaller Eastern European and Asian markets. The film benefited from being released in the wake of the global success of The Conjuring 2. It debuted at first place in Russia with $1.7 million. Its other top openings were recorded in South Korea ($3.9 million), France ($1.5 million), the U.K. ($1.4 million) and Spain ($1.1 million). Its biggest earning markets are South Korea ($7.7 million), Mexico ($5.5 million), the U.K. ($4.5 million) and Spain ($3.9 million). On review aggregator Rotten Tomatoes the film has an approval rating of 77% based on 171 reviews, with a weighted average rating of 6.32/10. The site's critical consensus reads, "Lights Out makes skillful use of sturdy genre tropes—and some terrific performances—for an unsettling, fright-filled experience that delivers superior chills without skimping on story." On Metacritic, the film has a score of 58 out of 100, based on 34 critics, indicating "mixed or average reviews". Audiences polled by CinemaScore gave the film an average grade of "B" on an A+ to F scale. Lucy O'Brien of IGN gave the film 7/10, saying: "[w]ith an unnerving monster at its core, great cast and relentless final sequence, Light’s [sic] Out is a debut director Sandberg should be proud of. A clunky script occasionally loosens its grip on the nerves, but chances are Diana will still have you sleeping with the lights on for a good while after leaving the theatre." Richard Roeper of the Chicago Sun-Times awarded the film 4 stars out of 4, stating: "[e]ven the most cynical, jaded, seen-it-all-before critic cannot deny certain visceral reactions to a film. 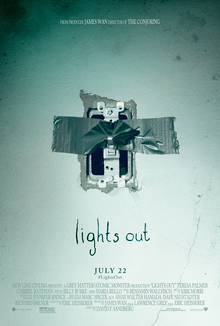 Lights Out gave me the chills." Justin Lowe of The Hollywood Reporter wrote, "[a] surprisingly maternal horror movie that relies as much on fraying emotional bonds as supernatural suspense to create tension, Lights Out deals with an array of primal fears that threaten to unravel a family’s fundamental relationships, along with their sanity." Jeannette Catsoulis of The New York Times wrote, "[s]packling over any copycat cracks with strong acting and fleet editing, Lights Out delivers minimalist frights in old-school ways." A few critics were less taken with the film. James Berardinelli of Reelviews gave 2 stars out of 4, saying: "[u]nfortunately, the film stumbles, offering too few legitimate scares and displaying an overreliance on traditional horror movie clichés." Berardinelli detested the film's camerawork, characters as being "thinly drawn", and the screenplay "spending inordinate amount of time providing a backstory..." Rex Reed of The Observer gave 1 star out of 4, saying: "the film's screenplay focuses almost entirely on the number of resourceful and ingenious ways the characters dream up to keep the lights on, stave off the next attack and stay alive—lights from candles, flashlights, cellphones, the car in the driveway—before the batteries die; The fun wears out fast and so does the “gotcha” factor." In July 2016, a week after the film's release, it was announced that New Line Cinema and Warner Bros. Pictures had greenlit a sequel. Heisserer and Sandberg will return to write and direct the film, respectively, while Wan and Lawrence Grey will return to produce under their Atomic Monster and Grey Matter Productions banners. In June 2018, Sandberg stated that his then-upcoming film Shazam! would be set in the same fictional universe as Lights Out, featuring a character from that film in a cameo appearance, later revealed to be Andi Osho's Emma Glover. In addition, Lotta Losten, who previously portrayed Esther Crosby in Lights Out, portrays Lynn Crosby in Shazam!. ^ "LIGHTS OUT (15)". British Board of Film Classification. June 7, 2016. Retrieved June 8, 2016. ^ Murray, Rebecca (April 18, 2016). "'Lights Out': Lawrence Grey Interview on the Horror Film". ShowBiz Junkies. Retrieved April 22, 2016. ^ a b "Lights Out (2016)". Box Office Mojo. IMDb. Retrieved December 18, 2016. ^ Woener (March 26, 2016). "Meredith". Retrieved June 7, 2016. ^ a b c Wixson, Heather. "LIGHTS OUT Interview: Director David F. Sandberg & Lotta Losten on Journeying from Sweden to Hollywood & the Advantages of Technology for Emerging Filmmakers". Daily Dead. Retrieved August 17, 2016. ^ McNary, Dave (June 17, 2015). "Gabriel Bateman to Star in James Wan's 'Lights Out'". variety.com. Retrieved July 2, 2015. ^ Busch, Anita (June 27, 2015). "Teresa Palmer To Star In James Wan's 'Lights Out' For Atomic Monster, New Line". deadline.com. Retrieved July 2, 2015. ^ "On the Set for 6/29/15: Justin Lin Rolls Cameras on 'Star Trek Beyond', Emilia Clarke Wraps 'Me Before You'". ssninsider.com. June 29, 2015. Archived from the original on June 30, 2015. Retrieved July 2, 2015. ^ "Teresa Palmer Joins LIGHTS OUT with James Wan". hellhorror.com. June 29, 2015. Retrieved July 2, 2015. ^ Sandberg, David F. (August 9, 2016). "dauid comments on What Makes a Movie Scary?- Now You See It". Reddit. Retrieved August 20, 2016. ^ a b "James Wan on Instagram". Instagram. August 5, 2015. Retrieved August 5, 2015. ^ a b c "Lights Out director David Sandberg defends the ending of his horror hit". aThe A.V. Club. July 30, 2016. Retrieved July 22, 2017. ^ "Idris Elba's 'Hundred Streets,' 'Lights Out' to Debut at LA Film Festival". April 22, 2016. ^ D'Alessandro, Anthony (July 19, 2016). "Warner Bros./New Line Turning On 'Lights Out' With Comic-Con Screening". Deadline Hollywood. Retrieved July 23, 2016. ^ D'Alessandro, Anthony (December 21, 2015). "Guy Ritchie's King Arthur Film Gallops To 2017; 'Lights Out' Set For Summer". Deadline Hollywood. Retrieved July 23, 2016. ^ "'Star Trek Beyond' To Blast Off Fueled By Comic-Con World Premiere – Box Office Preview". Deadline Hollywood. July 19, 2016. Retrieved July 19, 2016. ^ Rebecca Ford (July 22, 2016). "Box Office: 'Star Trek Beyond' Blasts Off to $5.5 Million Thursday". The Hollywood Reporter. Retrieved July 22, 2016. ^ Scott Mendelson (June 24, 2016). "Weekend Box Office: 'Ice Age' Melts (In America) While 'Lights Out' Shines Bright". Forbes. Retrieved July 28, 2016. ^ Anita Busch and Anthony D'Alessandro (July 25, 2016). "'Star Trek Beyond' Launches To $59M; 'Lights Out' Electrifies; 'Ice Age' Tepid; 'Ghostbusters' No Cinderella Story – Box Office Final". Deadline Hollywood. Retrieved July 28, 2016. ^ Nancy Tartaglione (August 21, 2016). "'Pets' Pushes 'Suicide Squad' From #1 Offshore Perch, Collars $675M WW; Supervillains Gain On $600M – Intl B.O." Deadline Hollywood. Retrieved August 22, 2016. ^ Nancy Tartaglione (August 28, 2016). "'Bourne' Back At #1; 'Ice Age' Skates Across $300M Offshore; 'Pets' Prances Past $700M WW – Intl Box Office". Deadline Hollywood. Retrieved August 29, 2016. ^ Anita Busch (September 11, 2016). "Warner Bros.' Weekend Trifecta With 'Mil-Jeong,' 'Sully' And 'Suicide Squad' – Int'l Box Office". Deadline Hollywood. Retrieved September 12, 2016. ^ "Lights Out (2016)". Rotten Tomatoes. Fandango. Retrieved July 30, 2016. ^ "Lights Out Reviews". Metacritic. CBS Interactive. Retrieved April 9, 2017. ^ O'Brien, Lucy (July 1, 2016). "Fear the dark". IGN. Retrieved July 29, 2013. ^ Roeper, Richard (July 21, 2016). "'Lights Out': In the dark, this supremely scary movie glows". Chicago Sun-Times. Retrieved July 29, 2016. ^ Lowe, Justin (July 9, 2016). "Accomplished, but not especially distinctive". The Hollywood Reporter. Retrieved July 29, 2016. ^ Catsoulis, Jeannette (July 21, 2016). "Review: In 'Lights Out' an Invisible Friend Turns Malicious". The New York Times. Retrieved July 29, 2016. ^ Berardinelli, James (July 21, 2016). "Lights Out (United States, 2016)". Reelviews. Retrieved July 29, 2016. ^ Reed, Rex (July 20, 2016). "'Lights Out' Is a Sad Excuse for a Horror Flick". The Observer. Retrieved July 29, 2016. ^ Fleming Jr, Mike (July 27, 2016). "New Line Sets Sequel To Fright Sensation 'Lights Out'". Deadline Hollywood. Retrieved July 28, 2016. ^ McNary, Dave (July 27, 2016). "Sequel to Horror Film 'Lights Out' in the Works at New Line". Variety. Retrieved July 28, 2016. ^ "'Shazam!' & Horror Flick 'Lights Out' Share Same Cinematic Universe, Apparently". cbr. Archived from the original on June 17, 2018. Retrieved December 7, 2018. This page was last edited on 19 April 2019, at 11:36 (UTC).